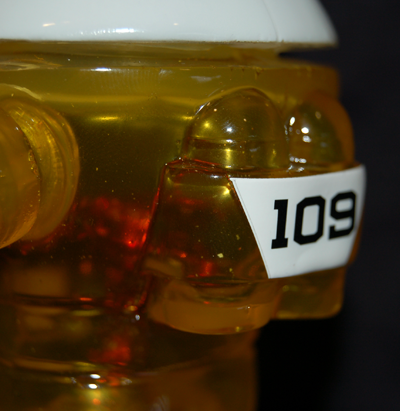 I’ve been messing around with this guy since I bought him at NYCC, so I wanted to give him some proper coverage. 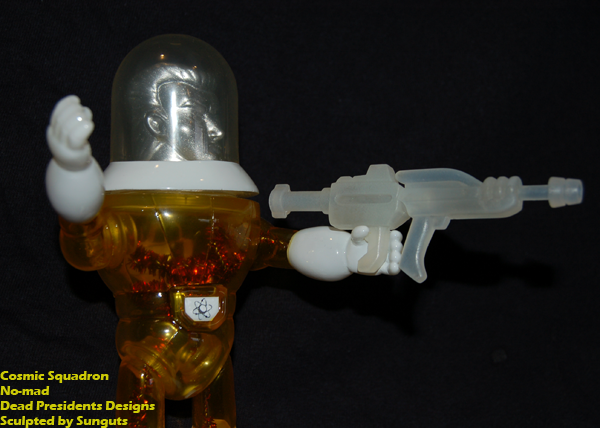 Dead Presidents (Matt Walker) designed a neat vintage style spaceman as a way to combine his love of vinyl toys, tin rayguns, and classic-ey spacemen. The design by Matt was sculpted by Sunguts, a Japanese vinyl designer known for solid sculpts and cute designs, and the result here is fantastic. The Cosmic Squadron has been heating up Japan, and a proper US launch is on the near horizon. I love the heroic fight figure proportions. 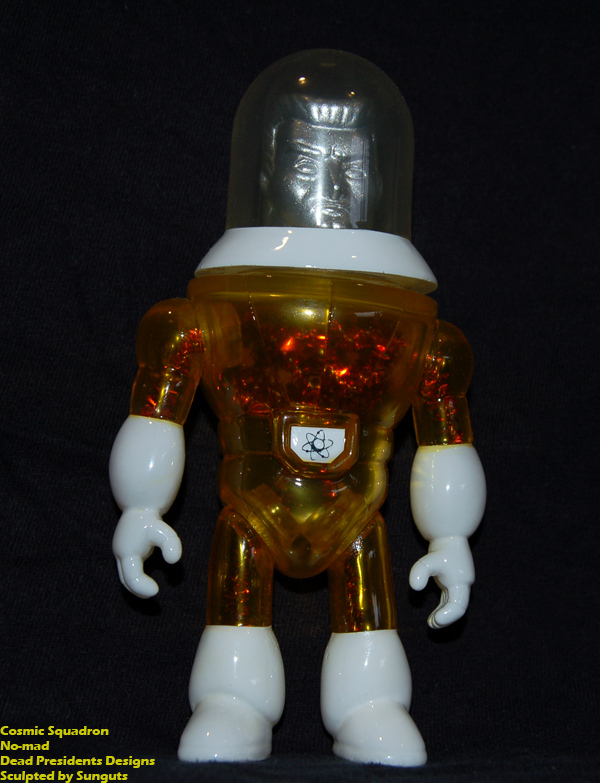 The Cosmic Squadron stands about six inches tall with the helmet on, and all the releases so far have been on crystal clear Japanese vinyl. The Cosmic Squadron guys have all been painted by Matt Walker using Monster Kolor, and it shows. Clear figures do not get any better than this. One thing to note, I added the pipecleaners myself, but there have been some one-offs by Matt for shows with pipecleaners, so I couldn’t help but steal the look. 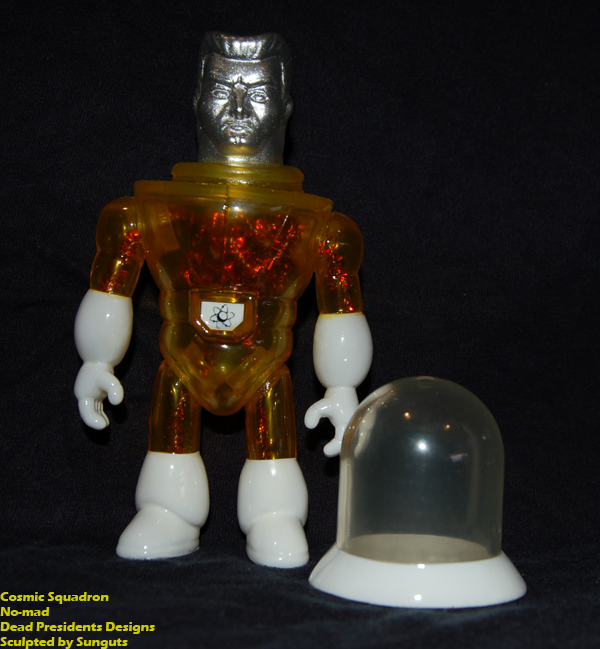 The clear helmet comes off to reveal the spaceman’s head. 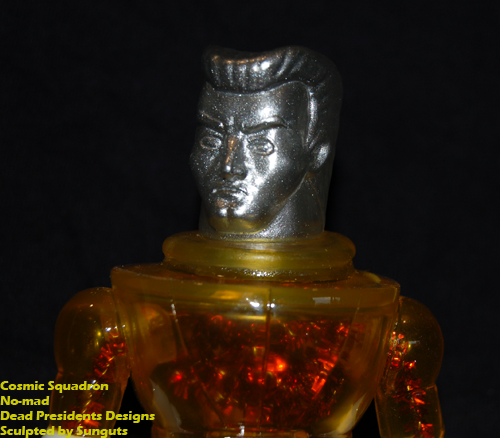 This is the No-mad version, and is done in classic Microman colors. The shiny silver head is gorgeous. The headsculpt is really classic and heroic as well. 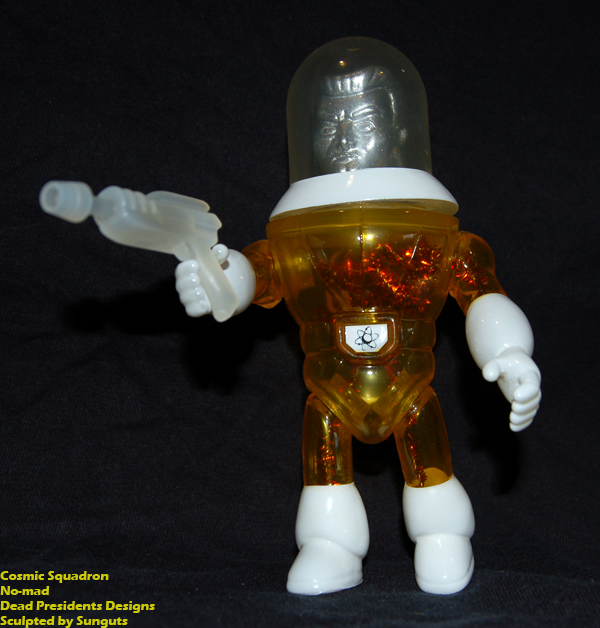 The ‘regular color’ version Cosmic Squadron is fully painted, and really looks like a vintage figure. 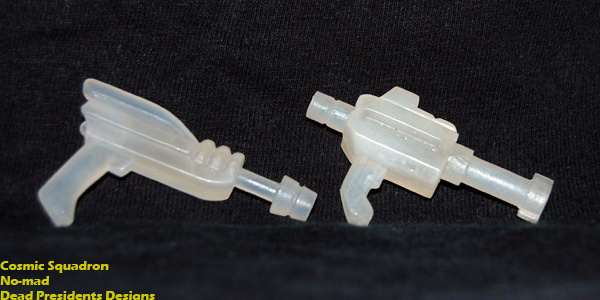 The rayguns are totally vintage styled, and designed by Matt Doughty (Onell Designs). They are cast in resin and flawless. 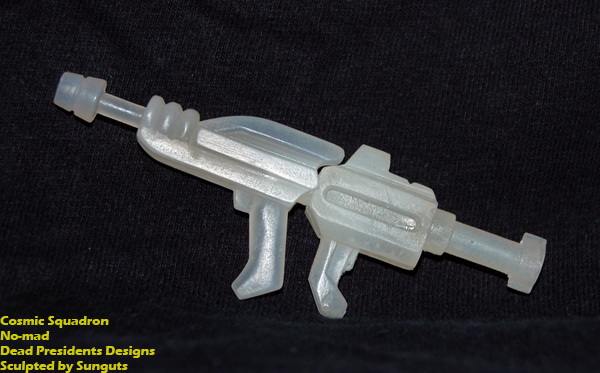 The guns also hook together to make a blaster rifle! The guns fit pretty well in the hands. Matt showed me this alternate use for the one gun as a space hammer. The rifle and guns really look the part. What’s cool is that the belt logo and backpack detail are actually vinyl stickers applied to the painted figure, and then sealed on using the same Monster Kolor gloss coat as the rest of the figure… they are seamless, and flawless! 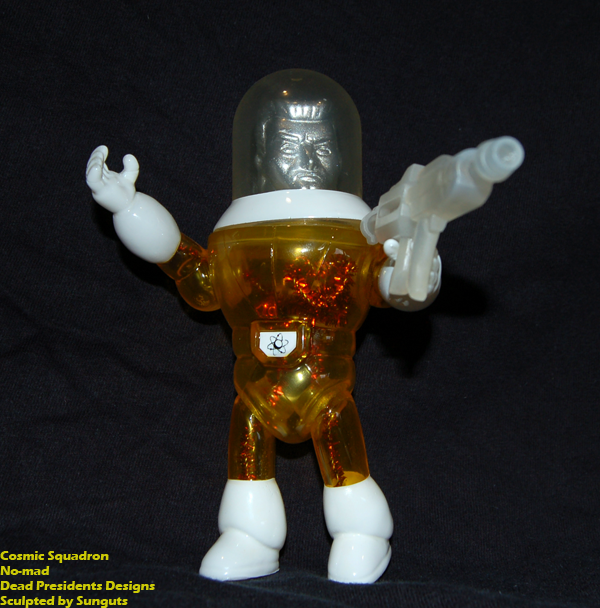 I really enjoy the Cosmic Squadron figure and am looking forward to what’s coming next. 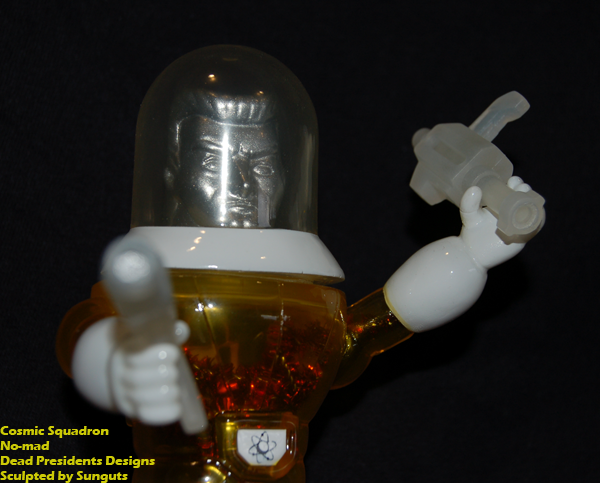 The clear vinyl is gorgeous, and the figure is a perfect size to mess around with. 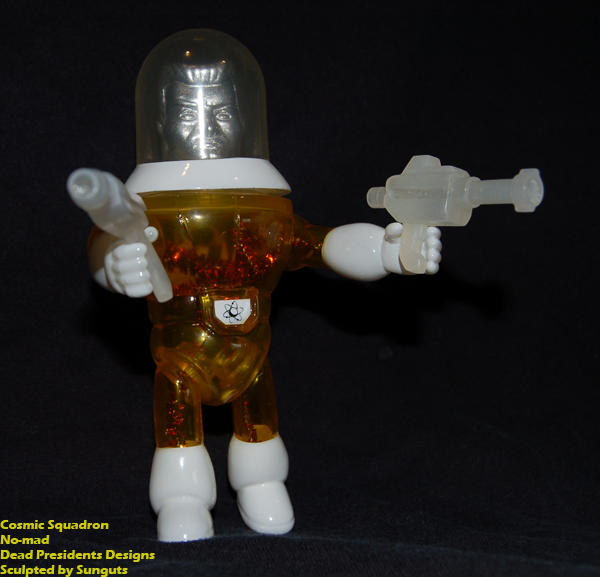 You can keep an eye out for news on the Cosmic Squadron site, and the Dead Pre$idents blog. They are also available now on the One Up site, a Japanese shop that loves and carries Matt’s stuff in Japan! They do ship international. 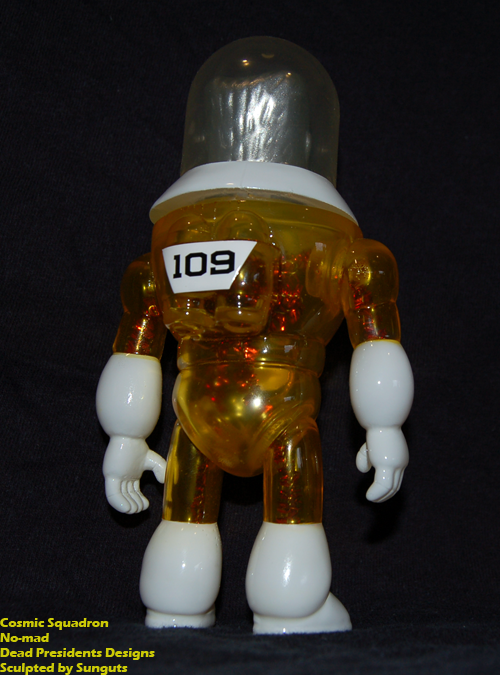 There’s a bunch of clear Microman colored versions up right now from the In Living Kolor-coinciding drop! 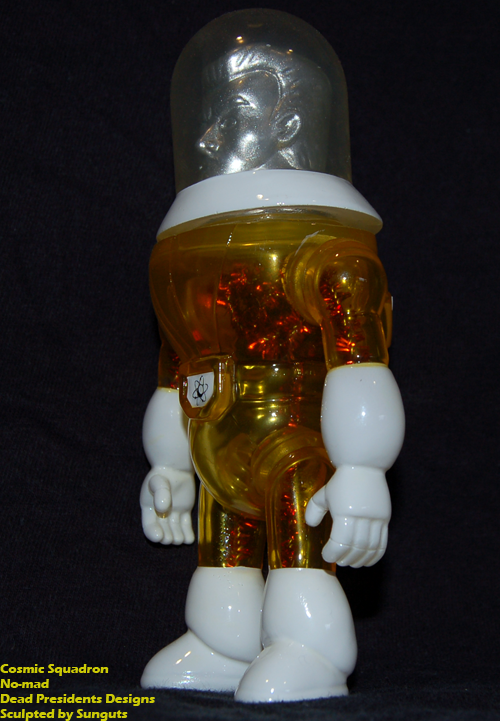 « Neo Eyezon Mark Nagata X Prometheum5 Collab!